Why The Portrait Place for Senior Portraits? Did You Know We're Grosse Pointe's Most Popular Senior Portrait Studio? The best kept secret in our high schools is that you don’t have to use an "official" school photographer any longer for your senior portraits. Our high schools have realized that parents and students want a choice, and don't want to be locked into 1950s style portraits. 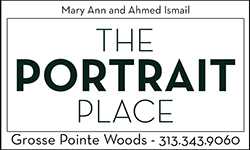 Instead of going to the same old photographer for the same old yearbook photos, hundreds of North, South, ULS and U of D Jesuit seniors have decided to shop local and come to The Portrait Place! We take awesome senior portraits because we LOVE creating them. Our whole approach to capturing your senior year is different from the traditional high school photographers. We capture you in a classic traditional image needed for your yearbook and class picture and automatically submit it to your school, no problem. The Portrait Place difference is that we go much further, and capture you in your sports uniforms, with your musical instrument, your best friend and/or your favorite pet! Our goal is to make sure that when we get done, you have a record of your senior year that you can enjoy twenty years from now with your children--pictures that make you laugh, cry, and everything in between! It's The Portrait Place difference, and why we're Grosse Pointe's most popular senior portrait studio! Check us out with your friends--chances are, we created their senior portraits. The bottom line is that if you're not 110% THRILLED with the portraits we create for you, we'll take them again at ABSOLUTELY no charge until you are! That's The Portrait Place difference. Personalized service from a local Grosse Pointe business, exceptional quality and exciting portraits of the REAL you! 1. We automatically submit your favorite traditional portrait to your school for the yearbook and the class picture. You don't have to do a thing--we do it all! 2. We give you plenty of images to pick from, not just a few like most senior portrait studios! 3. We don’t charge extra for skin blemish retouching! 4. We can remove braces in your photos for a nominal charge, too! 5. We believe in totally personalized service. We aren’t a “portrait factory” like so many school photographers! 6. We make you look your absolute best and make creating portraits a lot of fun! 7. Our prices are totally affordable — no loans needed! 8. We're a neighbor. Our studio is located close to your home and school--we're right on Mack Avenue in Grosse Pointe Woods! 10. The most important reason — our work is 110% guaranteed. If you’re not 110% thrilled (not just happy) with your portraits, we’ll shoot them over at absolutely no charge until you are!